These conceptual 3d illustrations were completed for a new restaurant design pitch/proposal. 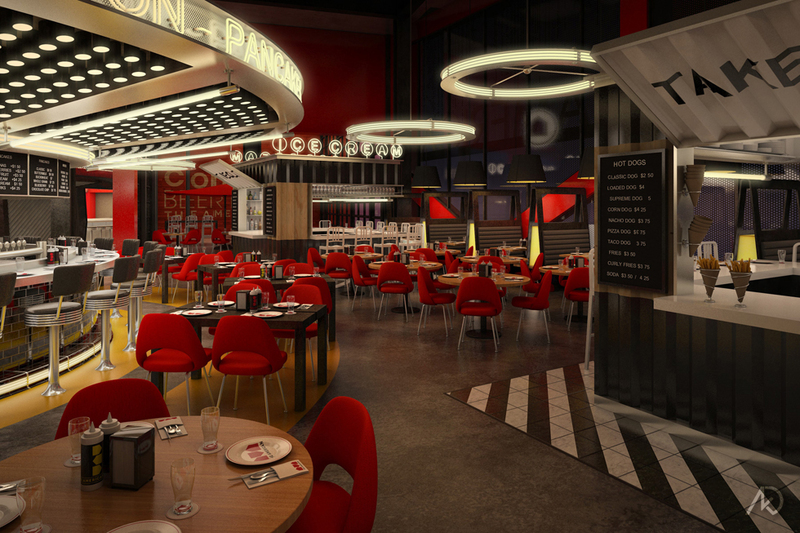 The restaurant, located in Las Vegas within a major hotel and casino, will have a casual diner atmosphere. 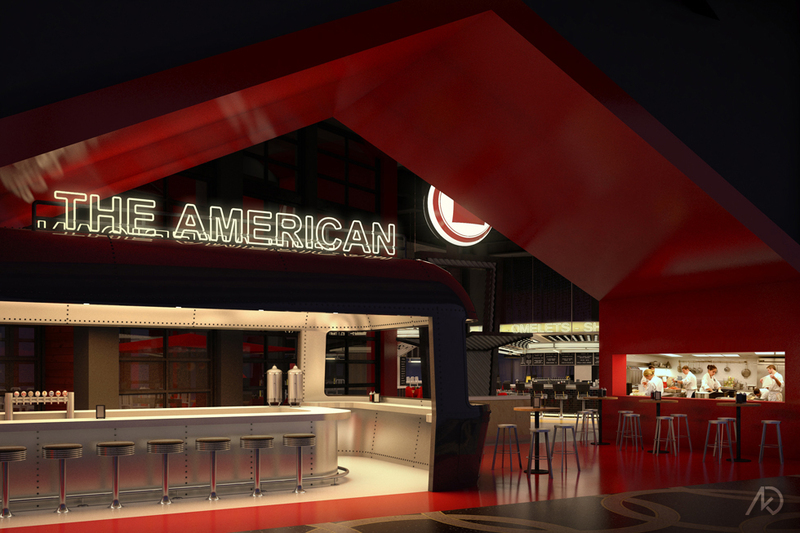 The renderings show two large bars that double as food counters, high-back banquette seating, cafe seating, and two pop-up kiosks serving a la carte items such as hot dogs and ice cream. The illustrations were produced in conjunction with the schematic design of the space. The 3d model was used to test and try different design options on items such as the overall layout, counter sizes, the counter canopy, and banquet heights. The 3d model also contains a great deal of smaller branded elements – have a look at the table settings. All items in the scene (except for a few bottles) were modeled, textured, and lit by kk. 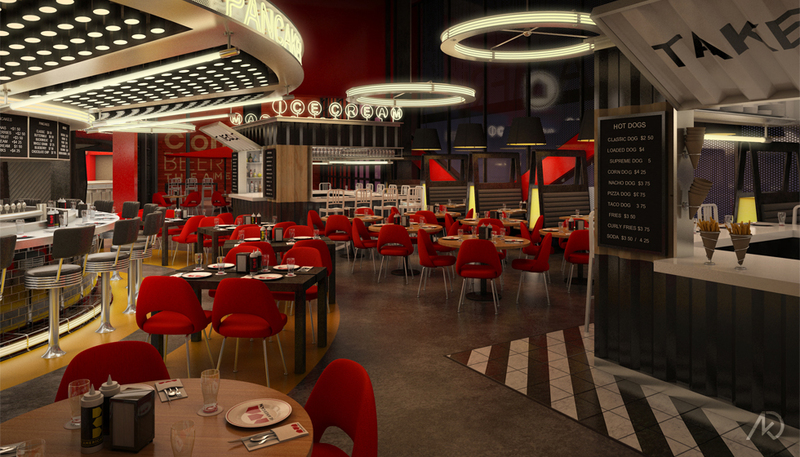 The left side of the image image shows the all night diner counter and the large canopy above. The canopy evolved over a period of time as it quickly became a very large focal point of the design. One can also see the general cafe seating and the high-back banquettes in the rear. To the right of the image one can see a pop-up kiosk. These container-esque structures will help to activate the interior of the space while providing quick eats and smaller bar seating. This image, based on Edward Hopper’s painting Nighthawks, shows the diner entry from the casino floor. Branded elements from classic Americana such as the Airstream trailer, neon signage, a gas station globe, and the red Monopoly house fill the view. From here, patrons also have a direct visual access to the kitchen.